This week I visited the roof garden at John Lewis in Oxford Street, designed by Tony Woods. Tony is a former RHS Young Designer of the Year. 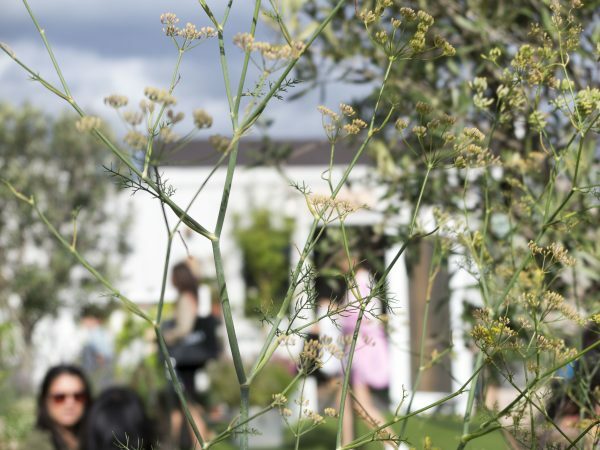 He and his team, Garden Club London, specialise in urban gardens, roof gardens, pop-up gardens and living walls. I asked him what we need to know in order to create a successful roof garden. 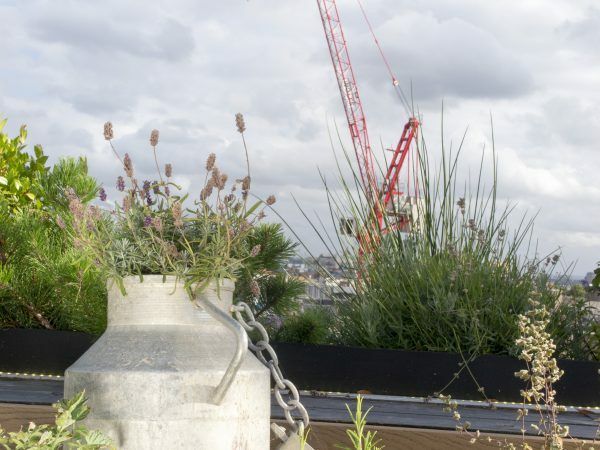 Six floors up, with views of the Houses of Parliament, the ‘Walkie Talkie’ and the London Eye, shoppers can have coffee, drinks or meals in the John Lewis roof garden. You can book a ‘summerhouse’, and feel a million miles away from the bustle of Oxford Street below. Unless you’re already living in a contemporary house with a purpose-built roof garden, Tony advises getting an architect or surveyor to establish what weight the roof can hold. And that doesn’t just mean the weight of pots, plants, soil and furniture. The John Lewis roof terrace is large, but the number of people who can be there at any one time is restricted. You might think that if you have a flat roof, and you know it’s strong, then you can take chairs and pots out there. Voila! Roof garden. But you have to have planning permission for a proper roof garden, which will probably also involve building controls. Amongst the issues they will want to consider are how you get onto the roof garden. Will you have to climb through a hatch? And how will you stop people falling off? Roof terrace walls need to be safe. Tony uses a solid barrier or glass walls because railings offer too much opportunity for children to climb over them. 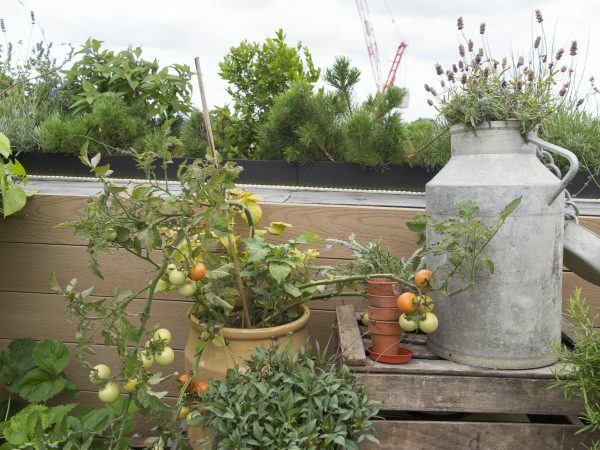 Container-grown veg do well on a roof terrace – it’s nice and sunny, though you need to protect them from the winds. 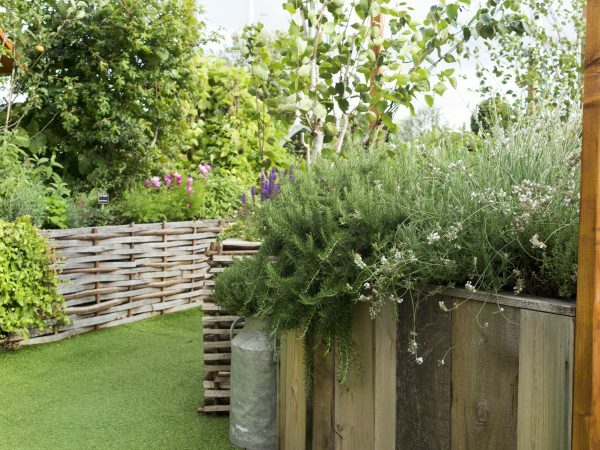 You’ll also need to consider how you get your roof garden building materials up onto the roof. ‘Luckily John Lewis had an old “carpet lift” from the days when people bought carpets in the store and took them away then and there,’ says Tony. ‘So we had a three metre high lift. Otherwise you’re restricted to whatever length or height of material that can go up the stairs or in the lift, unless you hire a crane. Most of us do not have a useful carpet lift (carpet elevator, if you’re reading this in the United States). So remember access at the design stage! Roof gardens are hot and exposed. Plants will need watering regularly, especially as they will be in pots. Large wooden planters need less watering than lots of small pots. 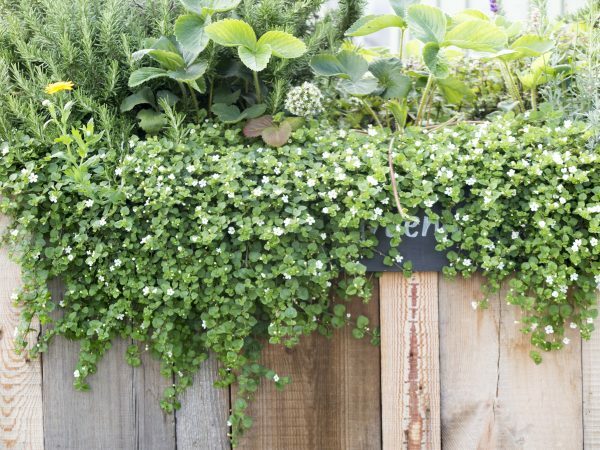 A roof garden could be very invasive as far as your neighbours are concerned. Think about screens and where you’re going to look. There weren’t many issues of privacy for John Lewis, because they are surrounded by shops and offices. But they did still need screening. Their neighbour to the left has a large neglected roof, with air conditioning units and other ugly detritus. ‘We put up a row of amelanchier trees and a hedge to screen that view,’ says Tony. You can just see a dilapidated roof behind this bird box, but most of it is screened from view by hedging. 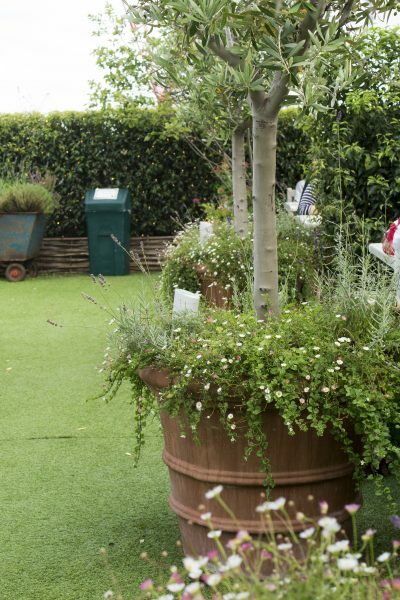 Tony created the John Lewis roof garden in 2013. ‘The London skyline has changed considerably since then. There’s lots of building, so although most of the hedging is fixed, we move pots around every year to block any ugly sight lines’. Tony moves some planters around every year in order to block some of the building work – although I love this juxtaposition of a high modern crane and an old-fashioned milk churn. Screening is vital on a roof garden, because it helps reduce the windiness. But a trellis or a hedge is much better than a solid wall. Wind is broken up when it whistles through a hedge or trellis, but it goes up a solid wall then lands, still furious, on the other side. Hedging screens some of the wind on the John Lewis rooftop. It isn’t very high hedging – not more than 5-6ft, which is enough to screen anyone sitting down, but not so high that it may get blown down. Note that the trees are pruned to have quite small canopies. You might think that roof garden furniture should be super-light. but could you be so careful in your own home? I blench at the thought of having to weight down garden furniture every time I leave a roof garden. Tony’s solution is to have garden furniture built in where possible. This is another advantage of built-in roof garden furniture. Tony’s team design benches with internal plastic clip storage boxes, so cushions and other accessories can be stored in completely weather-safe conditions. ‘And they can’t be eaten by mice, either,’ he adds. One of the delightful rooftop ‘summerhouses’ in the John Lewis roof garden. You can book one for your coffee or meal (like booking an ordinary table in a restaurant). Benches like these can be built to use for storage. 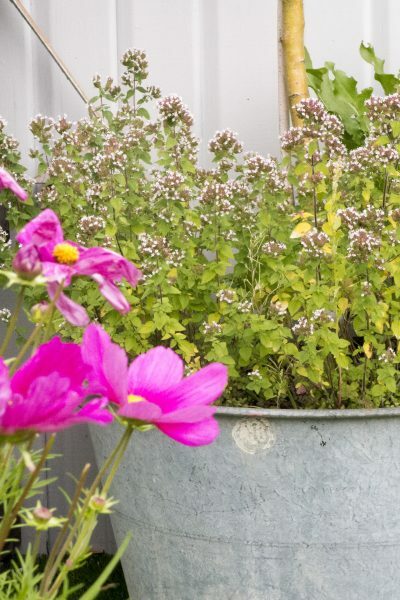 Like roof garden furniture, roof garden pots have conflicting issues of weight and stability. You probably don’t want to put lots of heavy pots on your roof garden, but if you put light ones they’re more likely to blow over (or away, if the winds are serious). Low planters with herbs and annuals on the John Lewis roof garden. This sort of planting is more stable than having high pots and plants. Tony’s first advice is ‘Don’t have lots of small pots. They dry out quickly and heat up, too. Go for large, sturdy pots.’ Sturdiness is about shape as much as anything – a tall pot or vase shape will blow over much more easily than a low or square shape. Tony uses sheets of polystyrene or polystyrene balls in the pots to insulate them against wind and heat. 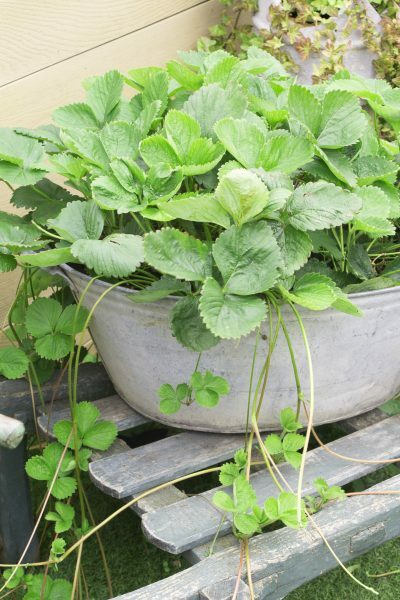 It reduces the amount of compost you need to use, which also makes large planters less heavy. You can also buy ‘light compost’ for roof terraces. The best plants for roof gardens are those with small or narrow leaves, says Tony. Pines, for example, are good at withstanding exposed conditions and have needle-like leaves, so the wind will blow through them rather than blow them away. Low plants, too, are better than high ones. Pines and grasses along the edge of the roof garden, plus a view of the London Eye. 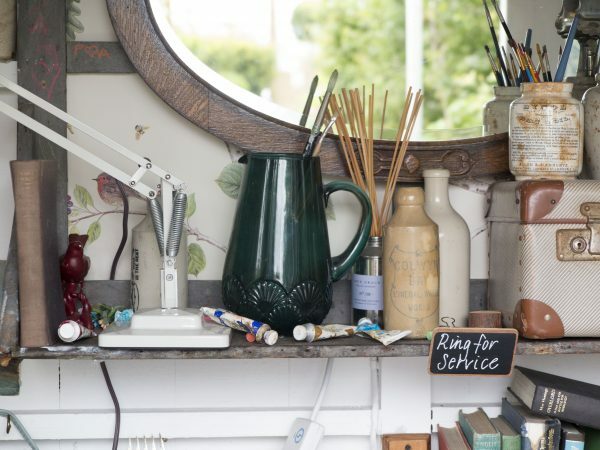 When Tony is called in to re-design a roof garden, he says he almost always ‘finds at least one smashed candle lantern lying on its side.’ Go for fitted lighting or lighting that’s easy to store. And if you have pretty displays, you need to find a way of securing them. These pretty pots and accessories on a vintage ladder on the John Lewis roof garden are glued down to prevent them being blown away. But you can close a door on this rooftop ‘summerhouse’ so that everything is safe. But most domestic roof terraces probably don’t have room for garden sheds or summerhouses. Tony advises something like a retractable sail for shelter. There’s the top of a skyscraper reflected in the glass – if you peer closely. 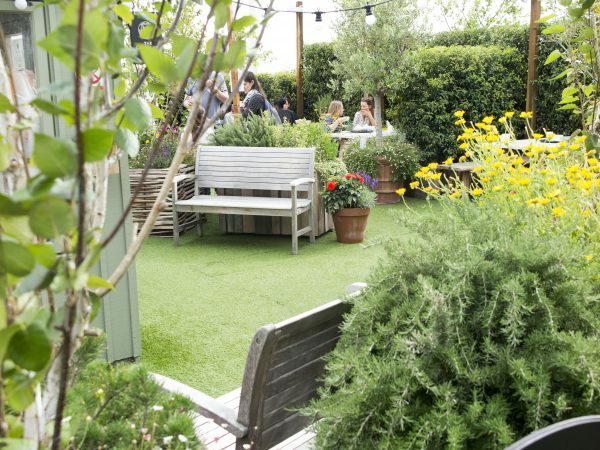 If your aim in having a roof garden is to feel closer to nature, then artificial turf may seem inappropriate. But a real lawn wouldn’t be viable. Decking or artificial turf add a layer of insulation to any roof, so they are still ‘greener’ than having a plain flat roof. Artificial turf on the John Lewis roof garden – planting and growing real grass just wouldn’t be viable. The decking on the John Lewis roof garden is a composite decking called Millboard. ‘Wood decking doesn’t always wear well,’ says Tony. ‘It gets slippery with algae in winter, and splintery in summer.’ Millboard is a wood-free composite that is moulded from real wood patterns. 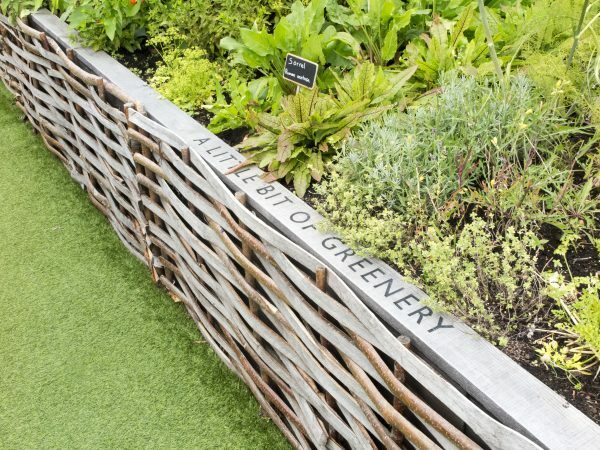 Once again, if you’re concerned about a green space being environmentally friendly, Millboard have had their carbon footprint verified by an independent body. They say it is about the same as a cup of latte. 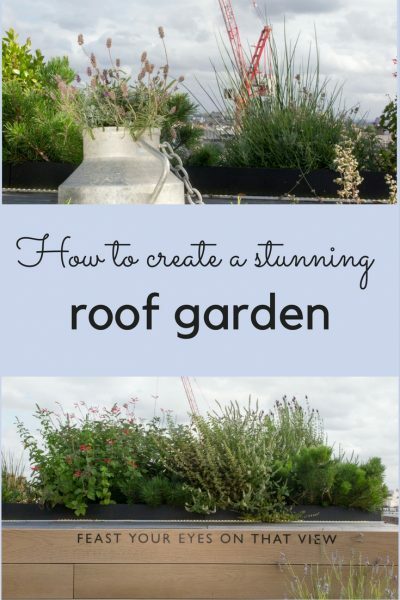 So why have a roof garden? I asked Tony what he was most proud of in the John Lewis roof terrace design. ‘I love people’s reactions – their surprise – when they first step into it. It’s a total escape from Oxford Street and the busy city.’ It is a genuine garden – although the themes are tweaked every year and pots are moved around – the hedges and trees have matured. Roof gardens are also environmentally positive, because they help reduce the heat given off by roof materials. When it rains, planters and plants absorb rain, thus reducing run-off. 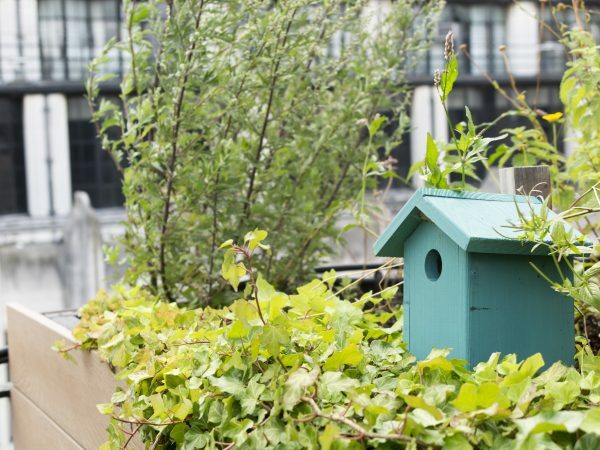 Roof gardens are a sanctuary for wildlife. Some of the John Lewis bird boxes are mainly decorative, but others have been placed under advice from experts. 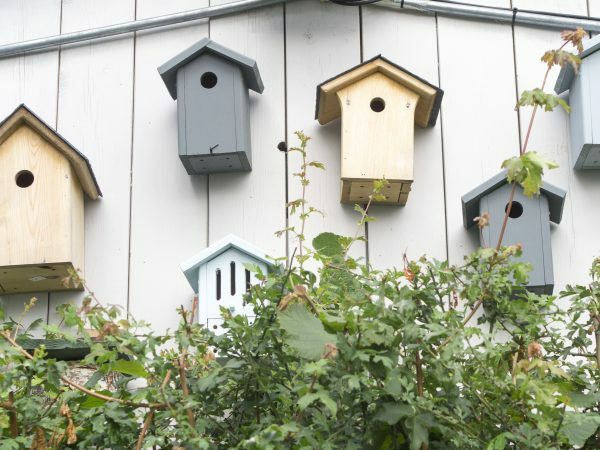 There’s a post here on what makes a good wildlife garden if you want to place bird, bat and bug boxes in the correct places. The wildlife have enjoyed the garden: ‘We’ve even had a pair of ducks trying to nest here, presumably to get away from the crowds in Hyde Park,’ says Tony. This year, there’s a greater emphasis on native plants and wildlife-friendly planting to evoke an English country garden. Roof gardens are usually sunnier than ground-level gardens, especially in cities (unless you’re surrounded by taller buildings that throw shade over your garden). 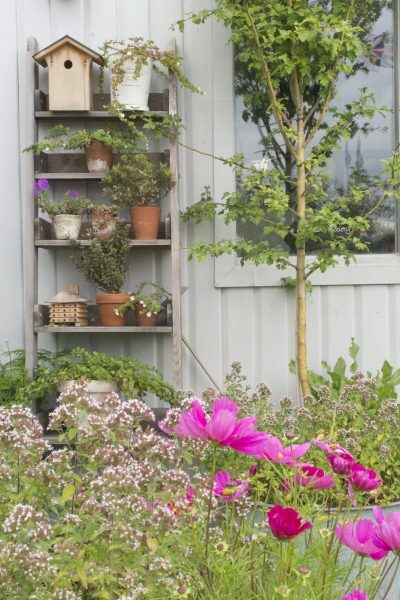 So roof gardens are a great place to grow sun-loving plants like tomatoes, aubergines and herbs. Herbs in the John Lewis roof garden. They’re used in cocktails, and in some of the restaurants. There have been unusual cocktails, such as a lavender cocktail or even one made with pine. I like the words…you could try a line of poetry, perhaps. A roof garden is a lovely sunny place to grow strawberries, although the birds got most of these. 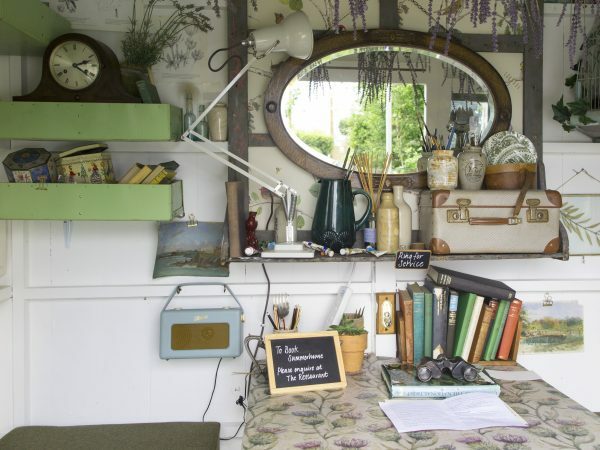 I visited a garden in Melbourne, Australia where the owner maximised her space for growing food by using her flat garage roof for beehives and sun-loving plants. 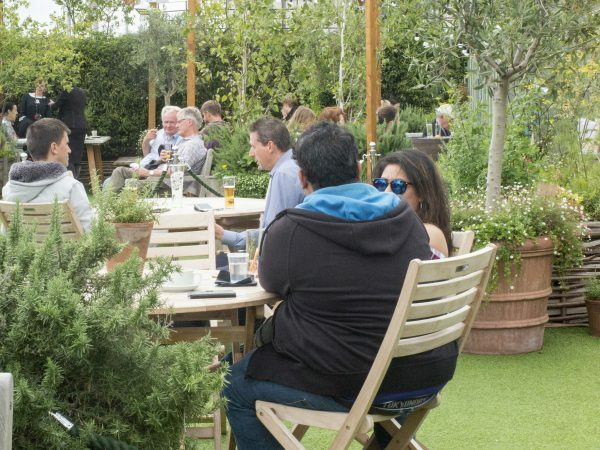 The John Lewis Rooftop Garden is open from April to September (check website for specific dates and times). There are a variety of activities and workshops as well as the cafe/pub/restaurant. And if you’d like inspiration from other gardens straight to your inbox every Sunday morning, then do enter your email at the top right of this page. Thank you! 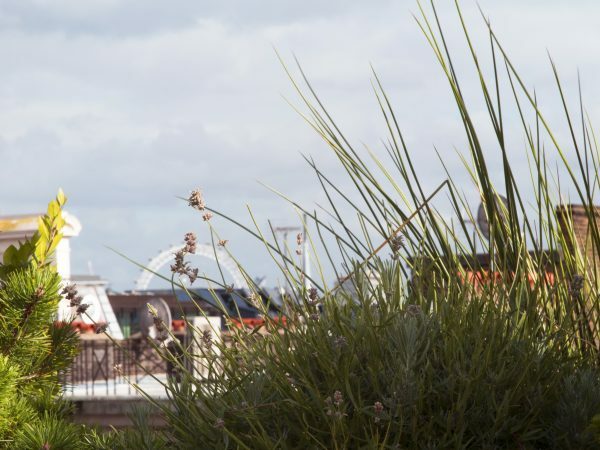 5 comments on "What you really need to know about creating a roof garden…"
The Kensington Roof Gardens are supposedly worth a visit when they are not being used for a private event. I’ve not managed to visit them yet. I went years ago, but I think they’ve changed alot since then. 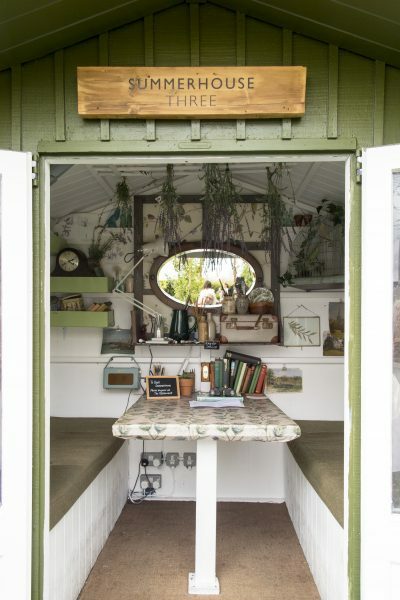 It’s actually quite easy to book a summerhouse – I got one without giving any notice at all. I get the feeling that this garden is still a bit of a secret, so definitely worth a try if you’re in the Oxford street area.